Philipp Dulichius is one of the German composers from around 1600 whose oeuvre has been almost completely neglected, despite the fact that in 1896 a German musicologist devoted a study to him. Whereas other composers took profit from the emergence of the phenomenon of the amateur church choir in Germany, Dulichius was overlooked. There are several reasons for this. One of these is that almost all his motets were written on Latin texts which made them less suitable for the Lutheran liturgy. Another is that they are scored for five to eight voices whereas the church choirs always consisted of four voices. When he was rediscovered in the late 19th century he was nicknamed "the Pomeranian Lassus", after Pommern, the region which today is partly in Germany and partly in Poland. Its main city was Stettin (now Szczecin) where Dulichius worked for many years as Kantor. He was born in Chemnitz as son of a cloth merchant who belonged to the middle class and several times took the position of mayor. He matriculated at Leipzig University in 1579. Held in high esteem in his time, his collections of music were widely disseminated and individual pieces, in particular those for double choir, included in anthologies. Dulichius's oeuvre comprises only sacred compositions which were printed in 12 collections between 1588 and 1630. The last year before his death he planned a publication of 100 motets; only 36 were printed. Until the end of his life he stuck to the traditional polyphony of the 16th century, the prima prattica. There is little text expression in the sense that individual words are depicted. In this respect the nickname "Pomeranian Lassus" is not really fitting, because in Lassus we quite often find elements of text expression and especially madrigalisms, which are largely absent from Dulichius. That doesn't mean that there is no connection between text and music, though. The dialogue between Jesus and the Pharisees about paying taxes to the Roman emperor (Magister, licetne censum) is realised through reduction and augmentation of the number of voices. The piece eloquently ends with just two voices singing unisono, expressing the text that the Pharisees left Jesus and "went away". The joyful character of Cantate Domino and Gaudens gaudebo in Domino (I rejoice in the Lord) comes across impressively, thanks to the lively rhythms. The disc closes with Lobet und preiset den Herren which is largely homophonic. Because of the rapid exchanges between the two choirs and the exhilarating rhythms it is a quite exciting piece. Now and then elements of a more immediate illustration of the text are noticeable. Dixit Iesus discipulis tuis includes an ascending line on "resurgere" (rise), whereas the word "mortuis" (the dead) is set to a low note. In Ecce, quam bonum an descending line is used to illustrate "quod descendit" (which flows down). There is also a madrigalism on "tympano" in Cantate Domino. A number of pieces are for double choir. It has been suggested that Dulichius had made a journey to Italy, but there is no evidence of this. He must have been very well aware of the practice of cori spezzati in Venice, though. He not only splits an eight-part texture in two opposing groups, sometimes these are of a different line-up, for instance a 'high' versus a 'low' choir, for instance in Benedic, anima mea and in Lobet und preiset den Herren. Notable is Deus noster refugium (God is our refuge and strength) for its use of a cantus firmus on the text "Si Deus pro nobis, quis contra nos?" - If God is for us, who can be against us? This is repeated several times by a tenor, supported by a sackbut. That brings us to the issue of performance practice. The programme has been divided into six groups of three motets each, ordered according to keys. Dulichius himself valued the use of the various modi of his time. In each group one motet is in an authentic mode and one in a plagal mode, with a composition in the modus connexus at the end. The performance pays tribute to the various ways in which sacred music was performed at the time. In some motets the voices are doubled by instruments, in others one or two parts are sung with the other parts played by strings or wind. In a couple of motets for double choir the instruments are divided: the strings play with the voices in the first choir, the wind join the voices in the second choir. This differentiation in performance practice guarantees a large amount of variety. 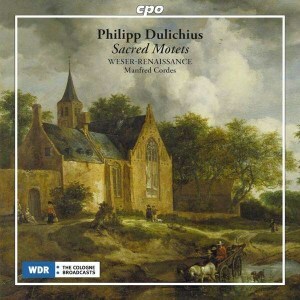 Not that the music of Dulichius really needs this: even with an a cappella performance his motets would make a lasting impression. Some of the Dulichius motets have been included in anthologies, but this is the first disc which is entirely devoted to his oeuvre, and that is well deserved. Apart from the fact that comparing him with Lassus isn't quite correct, he doesn't need it: Dulichius's music is very good in its own right. Weser-Renaissance delivers immaculate and often exciting performances. The solo contributions of various members of the ensemble are outstanding. The instrumentalists make much impression with their 'vocal' executions, and the balance between voices and instruments is perfect. The quality of music and interpretation means that this disc fully deserves to be labelled Recording of the Month.